DC Motor Electric Brakes – While operating electrical drives it is often necessary to stop the motor quickly and also reverse it. In applications like cranes or hoists the torque of the drive motor may have to be controlled so that the load does not have any undesir­able acceleration, e.g. in the case of lowering of loads under the influence of gravity. The speed and accuracy of stopping or reversing operations improve the productivity of the system and quality of the product. For both the applica­tions stated above, a braking torque is required, which may be supplied either mechanically or electrically. In the former case, the frictional force between the rotating parts and brake drums provides the required braking. Mechanical equipment, such as brake linings and brake drums are required. On the other hand, in DC Motor Electric Brakes a braking torque which opposes the motion of the rotating member is developed during the braking operation. This is achieved by suitably changing the electrical connections of the motor. The motor oper­ates on a speed-torque characteristic depending upon the method of braking employed. Whether mechanical or electrical, the braking of the drive should be such as to stop the motor at the specified point of time and location, for reasons of safety. 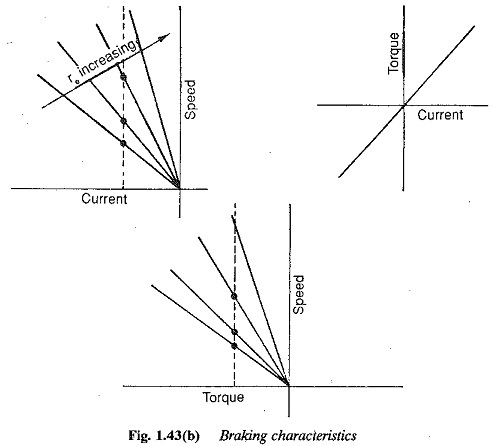 A comparison of electrical and mechanical braking is given in Table 1.5, to bring out the effectiveness and superiority of electrical braking. However, in hoists a stand by mechanical brake system is also provided, to avoid accidents in case of power failure. From the preceding discussion it is clear that electrical braking is preferable. However, in view of the severe operating cycle of the motor, it should be employed only when it is highly desirable to control the retardation and limit the braking time. To bring the driving motor completely to rest in a given amount of time and at exactly specified points. While doing so, the K.E. is fed back to the mains. To restrict the speed to safe values. This arises normally while lowering loads using a hoist or crane. While maintaining constant speed the excess of K.E. and P.E. of the load tending to accelerate the motor is fed back to the mains. We have seen that DC Motor Electric Brakes makes it possible to convert the K.E. of the rotating parts to electrical energy. This energy can be returned to the mains or dissipated in an external resistance. The braking is called regenerative when the energy is returned to the mains. It is called dynamic or rheostatic braking when the energy is dissipated in a resistance. In either case the machine operates as a generator. Electric machines are capable of smooth transition from motor to generator action. The load forces the motor in some applications to accelerate beyond no-load speed. The induced voltage becomes greater than the supply voltage to which the motor is connected and the current flows from the machine to the supply. It develops a torque to oppose the motion and hence to control the acceleration. The KE. and P.E., minus the losses of the motor, are returned to the mains and the motor runs at constant speed. Thus, regenerative braking eliminates any tendency of the load to accelerate the motor. Regenerative braking is also possible if the terminal voltage can be in­stantly decreased. The machine can be braked to zero speed. Reconnection of the motor is not necessary for regeneration. On the other hand, in dynamic braking the motor must be switched to the load resistance keeping the field constant. Counter current braking is accomplished by reconnecting the supply to the armature of the motor so that the motor draws a current to develop a torque to oppose its already existing rotation. The motor acts as a brake and comes to rest very fast but has a tendency to accelerate in the reverse direction. If reversal is not required the supply to the motor must be cut off at zero speed. In the case of dc motors this is achieved by reversing the polarity of the supply voltage to the armature, while for ac motors the phase sequence is altered. The method is inefficient because of power loss in the resistors used for limiting the current, due to interconnection. The mechanical energy is converted to heat; there is additional power input from the supply. This method of braking is also employed to maintain a constant speed when the load tries to accelerate the rotor to high speeds, e.g. in the case of induction motors a suitable resistance of the rotor shifts the point of operation to the fourth quadrant. This type of braking is possible in the case of drive motors where the speed can go beyond no-load speed or the terminal voltage can be momentarily decreased, e.g. in Ward Leonard control by decreasing the excitation of the generator. The armature current reverses and braking takes place. The speed-torque curve of the motor extends into the second quadrant. It passes through the no-load speed point with the same slope as in the first quadrant (motoring). The characteristics with different armature resistances are shown in Fig. 1:40. Any tendency of the motor to accelerate to speeds beyond no-load speed is offset by means of the torque Tb. This occurs, for instance, in a hoist lowering the load which overhauls the motor and tries to accelerate it. The transition takes place to the second quadrant and the torque developed maintains con­stant speed. The slope of the characteristic can be varied by an additional resistance in the armature. The speed-torque curves in the second quadrant, as affected by a smooth variation of applied voltage, are shown in Fig. 1.41. 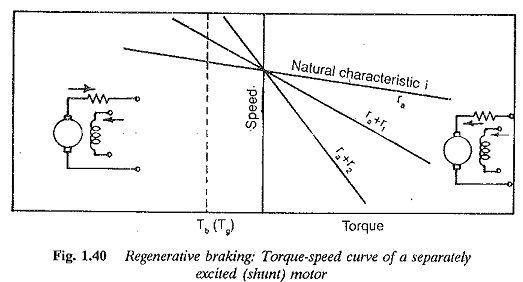 The braking can be accomplished here at constant torque Tb, as shown in the figure. The armature current is also constant. This kind of situation also occurs when the hoist is raising an empty cage. The counterweight moving under the influence of gravity tries to accelerate the motor and a transition to the second quadrant takes place. The torque developed is Tb, which maintains the speed constant. The K.E. trying to accelerate the rotor is regenerated to the mains. The nature of the speed-torque curve of a dc series motor is such that it does not extend to the second quadrant As no-load is approached, the speed increases asymptotically to the speed axis. This implies that an increase in speed of a dc series motor is followed by a decrease in the armature current and field flux. The induced emf cannot be greater than the terminal voltage. Regeneration is not possible in a plain de series motor since the field current cannot be made greater than the armature current. However, in applications such as traction and hoists, where series motors are used extensively, regeneration may be required. For example, in locomo­tives moving down a gradient a constant speed descent may be necessary and in hoist drives the speed needs to be limited whenever it becomes dangerously high. The regeneration in such cases is achieved by separately exciting the field, as shown in Fig. 1.42. The motor has characteristics similar to those of a separately excited motor. Regenerative braking is not possible if it is impossible for the motor speed to be greater than the no-load speed or if the armature voltage is constant and cannot be varied smoothly. Dynamic braking is em­ployed in such cases where the K.E. of the rotating parts is dissipated in an external resistance. The connections for dynamic braking are shown in Fig. 1.43. The motor op­erates at its rated voltage. When braking is required, the armature is switched on to an external resistance Re. The field remains connected to the supply with full excitation, and the induced voltage in the armature has the same polarity. The armature current reverses and flows in a direction opposite to the current during motoring (Fig. 1.43), developing a braking torque. Even though the motor is braked by generator action the method is not similar to regenerative braking. The braking is effective and the motor stops very fast if the field is available at its full value, for which reason it is separately excited. If the field is shunt excited, the field current falls with speed leading to very poor braking below critical speed. If separate excitation is employed the speed-torque characteristic is a straight line, as shown in Fig. 1.43. The slope of the line -KtKeΦ2N/(ra+Rc) decreases with an increase in Re. 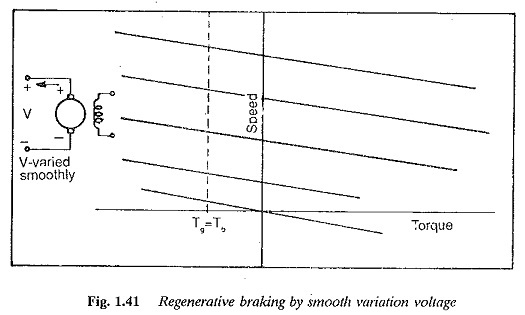 This shows that the braking torque decreases with an increase in the armature resistance, which increases the time of braking. A suitable value of Re can be chosen such as to obtain stopping in the required time. The method is adopted for non-reversing drives where regeneration is not possible. At the instant of initiating the braking, the current is more and hence the flux builds up. The torque developed is approximately proportional to the square of the armature current. At this instant the braking effect is more and there may be a jump in the torque developed, causing an objectionable shock to the load. In case this torque is objectionable, dynamic braking is employed by sepa­rately exciting the field (Fig. 1.44(c)). 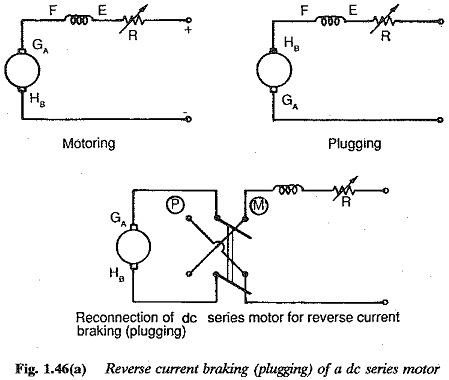 This braking is similar to that in shunt motors and has already been discussed. For quick stopping of the motor. For reversing drives requiring a short time for reversal. In cranes and hoists the motor is switched on to raise the load at the instant when the associated gearing operates in the direction to lower the load. If there is a load torque TL, the total braking torque is Tb + TL. In Fig. 1.45(b), the curve (1) indicates the speed-torque curve of the motor and curve (2) indicates the speed-torque curve during braking. In both cases of braking and acceleration the same resistance Re is connected. Let the motor be operating at Point A before plugging takes place. The operation is in the first quadrant. When the armature is reversed for braking, it may be assumed that the speed remains the same due to inertia (the limiting resistor is in the circuit). The point shifts to B in the second quadrant. 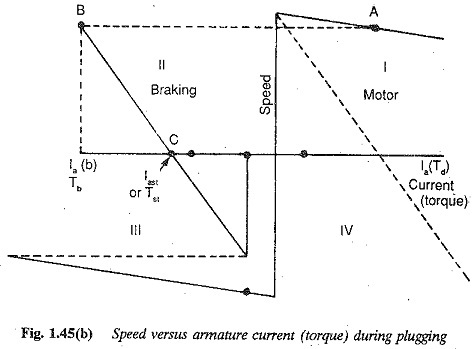 The developed torque added to the load torque retards the rotor and the speed decreases along BC. If speed reversal is not required the motor must be switched off when the speed reaches zero at C.
If the motor is not switched off at zero speed, the developed torque accelerates the rotor in the reverse direction. Now the Polarity of the induced voltage changes. The applied voltage and induced voltage oppose each other. The motor operates in the third quadrant. The series resistance can be short circuited, so that the motor operates on its natural characteristic. Plugging or reverse current braking may be employed to lower the load at constant speed. If the friction torque is greater than the load torque the motor is stationary. In the opposite situation the motor accelerates in the direction of the load. At this moment the armature supply is reversed, with a suitable resistance to limit the current. The torque developed retards the load being lowered and runs it at constant speed. 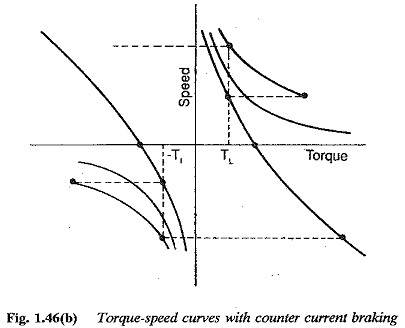 The torque-speed curves are as shown in Fig. 1.45(c). The point B on the curve corresponds to the stalling point. The current drawn by the motor is (V + E)/(ra + Re). The torque developed lowers the load at constant speed to point C.
Series motors: When the supply to the armature of a de series motor is reversed, care must be taken to see that the field current retains its direction, for effective braking. The circuit conditions of a series motor are as shown in Fig. 1.46. When the supply terminals are reversed, the polarity of the field must also be reversed so that there is no demagnetisation. 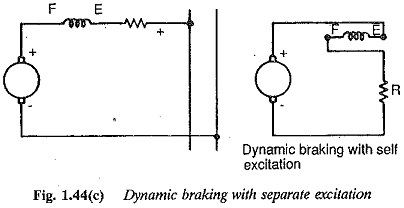 To limit the current during braking, an external resistance may be required in the armature circuit. Compared to de shunt motors the braking torque of dc series motor falls very rapidly with speed and below a certain speed braking may not be effective, because the field flux also decreases with speed. In the case of shunt motors the flux is constant in the complete braking region. 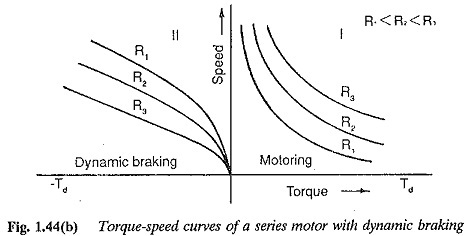 A typical speed-torque curve of a series motor during braking with external resistance is shown in Fig. 1.46(b). The curve of the motor with zero resistance is also shown. The braking torque depends on the load the motor is drivint at the instant of braking. The braking of the motor by this method is effective only if the load torque is less than the short circuit developed torque. Alternatively, the field may be separately excited during braking. 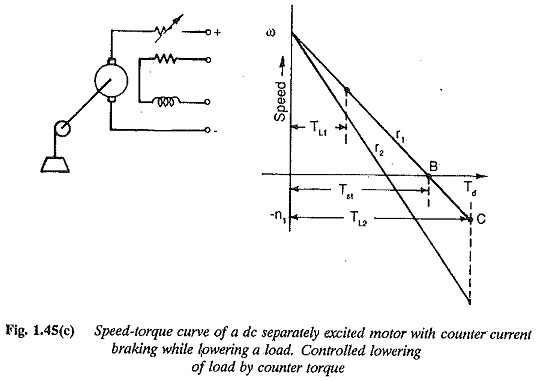 The braking characteristics in this case are obviously similar to those of a separately excited motor.